Chic Short Bangs Hair Styles. 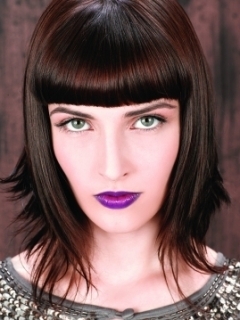 Enhancing the beauty of your face with a cute bangs style is the best solution to win the heart of your admirers. The chic short bangs hair styles adopt a unique attitude and aim to expose your features and add a stylish flair to your appearance. Stay fashion-forward and explore the latest hair styling tricks with the help of the modish hair styles below. After a long time we might get bored of the same old hair style, this is the moment when we crave for a brand new look or at least a cute and modern flair in our strands. This can be best achieved with the help of various and chic hair styling techniques. Bangs are named the ultimate solution to jazz up the plain and lifeless tresses. Choosing the best designs also help you polish your hair dressing skills as well as your style taste. Experiment with the looks that will definitely grab the attention of your friends and public in general. 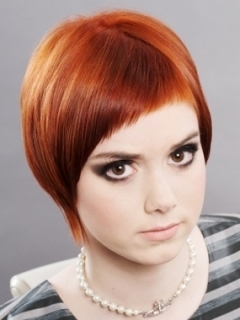 The chic short bangs hair styles cover also the field of short, medium as well as long hair. Due to their versatile and up-to-date allure, these expose what's best of your face and have also the power to reward you with a unique haircut. Spy on the newest hair styles trends to be constantly versed with the new inventions that pop up on the market. Bangs can do miracles with our look, moreover those who master the art of hair styling and cutting know that this tiny details is a real magic tool to create a perfectly-proportionate face. It is often used by hair gurus in order to add some length to the face as well as the forehead. Those who long for minor corrections when it comes to their appearance should not go far for life-saving solutions. 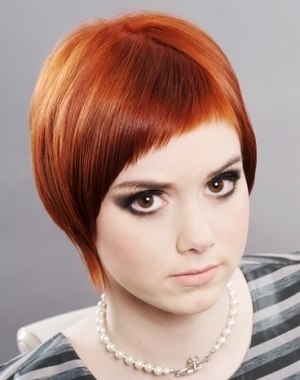 Instead, ask the help of your stylist to grant you with a dapper short bangs hair style. It is also important that baby bangs are not exactly for every face shape. Therefore, it is important to ask the advice of a professional hair dresser who knows which haircut would suit your face shape. Furthermore, it is important to be also confident and pleased with your unique traits as this particular length will expose a larger portion of both the forehead as well as the face in general. Those who would like to mask their nose, cheeks as well as other delicate spots should think first, then act. Short bangs can also vary in length, some of these reach just above the eyebrow area, others go way higher depending on the dimensions of your forehead. The higher it goes, the longer the face will visually become. For a futuristic style opt for the super-short bangs that enhance your classic Bob, blunt or layered haircut with a geometric flair. Fans of alternative looks will be thrilled to get an insight into the realm of modern hair styles that target the future of hair dressing. 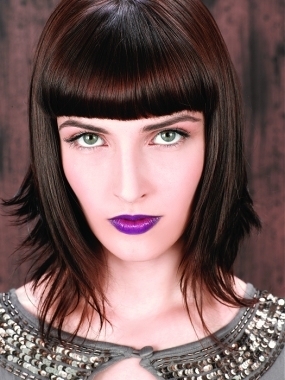 For a softer effect choose short still classy styled bangs that are just a bit above your eyebrows. These offer a frame to your face creating the desired and eye-pleasing effect. The full texture will further emphasize the refined allure of your look as well as the healthy and shiny condition of your locks. For the desired fab look use a flat iron to keep the bangs super-sleek. Wavy and curly bangs are also popular especially if you are proud of the volume and density of your strands. The regular touch-ups at the hair salon will secure the long-lasting effect of your hairdo. Don't forget about the must have hair styling tools and products to further polish your appearance with a few tricks. Statement short bangs are uber-popular due to their ability to make you feel confident with your image as well as to upgrade the monotonous appearance of your hair. Be a real bangs style trendsetter and impress your friends with your perfectly controlled and flawless bangs.